Today was a rainy, unseasonably chilly day in May. I waited most of the day for the rain to stop so that I could take my daily walk. I’ve always liked to walk but just in the past couple months I’ve become an avid walker; motivated by recent health problems and spurred on by my Georgian friend, I try to walk at least one hour each day. Today was no exception. The rain finally stopped. Although it was very chilly for a day in mid-May, a light jacket and a brisk pace were all I needed to keep myself comfortably warm. The sidewalks and streets were glistening wet, the wind was calm, the sky a gloomy, endless overcast that made the time of day seem later than it really was. For those of you who walk you’ll probably understand it when I say that a long walk exercises your mind as well as your body. I do my best thinking when I’m walking on a long walk as the day draws to a close. This evening with the wet streets, puddled sidewalks and lack of wind, the evening seem more quiet than most. And it was a Sunday too. There’s something different about Sunday. It seems more peaceful than other days. Maybe it’s just my imagination or maybe it’s because not as many people are out hurrying to and fro with something important on their minds that needs to be done. Whatever it is, Sundays seem much different to me than other days, and this Sunday seemed even calmer and more peaceful than most. Walks are great for thinking and daydreaming. If you aren’t a walker you’ll have to take my word for it and if you are then you know exactly what I mean. But, I want to mention here that walking is great for starting up my time machine. And, if you walk it probably has started yours a few times too. Most of us have seen movies or read books where time machines whisk folks forward and backward into another place and time. These time machines, are of course, still fictional figments of author’s imagination. But you might be surprised to learn that you can have a time machine. They cost nothing. You don’t have to buy one. You have had one since the day you were born and you take it with you wherever you go. Your time machine is your mind and while it cannot take most people forward in time, it can take you back to another time and place. It can take you wherever you want to go. As I walked tonight I heard a raincrow. Most of you call them mourning doves. I call them raincrows. And I’ll tell you why. When I was a young boy, probably six or seven, my grandfather and I used to sit out on the porch together most evenings. And sometimes, on a night like this one after it had rained and the evening was rather damp and dreary, we’d hear raincrows. I always loved their melancholy sound even when I was just a small boy. My grandfather told me that raincrows sing their sad songs whenever it is going to rain or after a rain. My grandfather was a smart man and he taught me a lot but I really don’t think this little bit of knowledge is true. Nonetheless it sounded good to me when I was a boy. In fact, I still like to think it’s true even though I know it’s not. There’s something special about raincrows. Raincrows remind me of someone special. And I’m a special person because I was special to him. And, come to think of it, I’m one of the few people who know what a raincrow is. Tonight, when I heard the raincrow’s coo, it sounded even more peaceful and mournful in the fading light of this chilly and gloomy evening. Its melancholy lament took me back to a time when I, a small boy, sat next to the greatest man in the word and listened to the raincrows. They were special times and just for a moment as I walked along tonight, I was there on his front porch, sitting there, a little boy, in another place and time with someone I dearly loved. I was happy to be with my grandfather for those brief milliseconds, of an evanescent thought – a glimpse into the past thanks to the sad song of the raincrows and my very own time machine. The sound of my steps came back into focus and I was back in the present. The streets quiet and wet, the air chilly and still, in the middle of my-little-town-Sunday evening walk. But the raincrows still sadly cooed and my time machine took me back to autumn days long past and my grandfather and I walking along Plum Brook with a big paper sack. We were collecting buckeyes. If you’re not from Ohio, the “Buckeye State”, you might think buckeyes are a football team and you’re partially right. Buckeyes though are nut-like things that fall from buckeye trees in autumn. You can do a lot thing with them, like make necklaces and use them for noisemakers by throwing them into a fire whereupon they explode with a delightful pop; but you cannot eat them. I think they are poisonous. But, trust me, I’m no expert and I sure I can’t tell you from personal experience. I never ate one. I never wanted to. I have been told they are and that was good enough for me as a seven year-old boy and it’s good enough for me now. Buckeyes are encased in a shell that looks like a little, light-green hand grenade with brownish spots. The prize, though, is inside. A buckeye resembles a chestnut. Sometimes people call buckeyes “horse chestnuts” – but don’t ask me why. They’re buckeyes to those of us who live in Ohio. To get at the nut inside, you can throw them on the ground, pound them with a hammer, or you can step on them (if you’re heavy enough or bigger than a seven year-old boy) to squeeze the very shiny nut out of its shell. And as my mind wandered, my very own time machine took me back to a beautiful autumn afternoon, decades ago. And suddenly my grandfather and I were walking down Galloway Road to Plum Brook. We continued on off the road and walked along the banks of Plum Brook collecting buckeyes that had fallen from the trees; which were now brilliantly orange, yellow and red on a perfect Fall day. I scooped up buckeyes from the ground and put them in the large, paper grocery bag we had taken with us and filled it until it was brimming.. It got so heavy I could not carry it; but my grandfather could and he did. We walked along together with our bag of buckeyes, on a seemingly ordinary autumn day, just the two of us. Little did I know then how special that day would become. When we got home, I sat for a long time splitting open all the buckeyes we had collected to get at the nut inside. I called my grandfather to show him what I had done. We picked the most perfect ones and my grandfather took them and drilled a hole in the center of each. When he was done I began stringing them together fashioning a buckeye necklace. I wore it proudly because I had made it myself (with my grandfather’s help of course). These were good times; innocent times. They were times treasured. They are moments which will live in me as long as I am alive. They are times which will never come again. Simply wonderful memories of a simpler time when I, a child, lived in a much smaller and more innocent world. The journey in my time machine ended and suddenly, I could see my breath floating up in clouds floating silently in the cool, damp air. Night was was coming quickly; I quickened my pace. This Sunday evening walk was an especially wonderful one, despite the cold and damp air. My time machine had been in perfect working order. A shiver ran through me as I realized that I had spent almost my entire walk with my grandfather tonight. He was with me even though he’s been gone from this world for decades. As long as I remember him he will always be a part of my life. And he will live on within me as long as I am alive. As I walked along alone on this peaceful, still, chilly Sunday evening I couldn’t help but smile a sad, yet happy smile, when I heard the raincrow coo once more. His melancholy song had started my time machine. An my time machine took me back to a beautifully innocent time in my life and allowed me to share time once again with someone very special. I hope that all of you who have children or grandchildren will always remember that you can fuel a child’s time machine and give them a lifetime of wonderful memories and moments they can relive over and over again. And, it won’t cost you much money. The most beautiful memories are created when you’re doing everyday things. Things that do not seem memorable while you’re doing them sometimes can turn out to be the most precious of all. Like raincrows and buckeyes, it’s the seemingly unimportant events and things in life that turn out to be the ones that we remember most fondly. If you have children or grandchildren remember that you can be the spark that will one day start their time machines. And maybe when they hear a raincrow they’ll think of you. 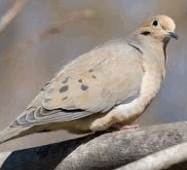 The bird shown in this article is actually a Eurasian Collered-Dove. A truly elegant bird. very quiet and gentle. Here I am — sitting at the computer. I am 87 and in September I’ll be 88. It doesn’t seem possible that I am that old– I don’t feel that old–and my kind friends tell me I don’t look that old. The number of birthday’s I have accumulated are proof however. Your Rant tonight has been delightful, I think I will have to read it to some of my new “Home Mates”. They will all likely have similar memories they will like to tell the group. You see I am living in a Seniors Lodge now — it is quite an adjustment. So I want to thank you for your memories — they will make others happy too. Beautiful essay. My eleven grandchildren/step-grandchildren all have more than one grandparent…most of them all still living. Myself, I had only a maternal grandmother ( I never knew my other grandparents…death and distance took them from me before I had the chance to meet them). She died when I was 17 …. the most devastating thing that ever happened to me…oh!…but the memories I had of her and our relationship live on in my 75 yr. old heart. I could write a book about the wonderful vivid memories I see to this day. I understand exactly the essence of this essay and how much our past makes our moments in thought brighter. My times with her were so simple, uncomplicated, loving and unhurried. I can even see you sitting with your grandfather as a seven year old youngster listening to the haunting sound of the Mourning Dove….one of my favourite birds. I truly enjoyed your beautifully written essay about rain crows and buckeyes; brought back a lot of wonderful memories. You write so beautifully; I felt like I was right there with you. Thanks for the memories. What a lovely story & so very true. My grandparents were gone before I arrived on the scene so I missed out on this type of memory. But it is true, we all have a time machine that will take us anywhere we want to go. And special memories like yours are a treasure! Well done! This is lovely, T.C. You have such a neat way of pulling your reader into the page with you. We are walking with you or sitting on that porch, sharing your time machine. Thank you for a gentle trip back to another time far away, long ago. I wasn’t lucky enogh to have a grandparent who could be that way with children. My grandfather was an old world German who seemed to think of us as rather a bother in his little world of card games and spittoons. He was never cruel to us, but he always seemed busy and would allow us to tag along as he went to feed the rabbits, but never stopped to talk and never played with us. Grandma would sing to us in German as we were doing dishes, and she had a laugh like a music box–but even she didn’t have time to talk with the kids. She spent a lot of time with my mom, though, and I would listen from time to time. I remember how she loved to laugh! Thanks for jiggling my memory box.